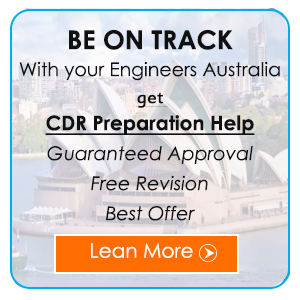 Engineers from all over the world are aspiring to pursue a successful technical career in any reputed organization of Australia, and wish for an Australian migration need to get their Competency Demonstration Report (CDR) approved by the Engineers Australia (EA) team. The EA certify and measure that the overseas candidate is skilled enough to set through the CDR documentation. They have a fixed set of rule and regulations for aspiring Australian Immigrants. Thus, it is very much needed to have proper knowledge regarding the documentation and stick to the specification. It is always recommended to avail the CDR Report Writing online service from the top writing expert. The whole CDR report is to be written in proper Australian English. This Australian English is quite similar to that of British English. Thus, you need to be very careful in choosing the words, spelling, writing style and draft it as per the Australian standards. Your own core competencies and skills should be properly demonstrated in the report. Choosing the best topics for the career episodes can win you half the battle. While applying for the CDR always goes through the competencies EA is asking from the candidates. Choosing the right occupational category like Engineering Technologist, Professional Engineer, Engineering Manager or associate). Choose all the events from your professional life that showcases your talents and competencies in any of these technical skills. You need to write the Summary Statement (SS) with a lot of attention since as per experts it is the first page assessed by the CDR selectors. Here you also need to give cross-reference from the projects already mentioned in the three career episodes in a proper way. The applicant should not take any risk with CDR since it makes reports to open the doorway to Australia. It is highly recommended for the candidate to opt for any professional CDR writing expert who will provide him with CDR report puff sample from where you can get an idea on how to write it. The Casestudyhelp.com is the best CDR report writing service provider in this sector. They will help you in getting your CDR on any technical specialization gets selected by the EA at 1 chance. The expert will also help you in getting your Australian immigration visa grated b the EA team.